Future Business Leaders of America-Phi Beta Lambda, Inc.
Congratulations! As a participant in the Future Business Leaders of America’s National Awards Program, Tyler Jones has proven that hard work and practice pay off. He received a check from the National Leadership Conference where he participated this summer in Baltimore, Maryland. Tyler attended workshops, opening/closing sessions and wrote essays to win his monetary award from the National level competition. 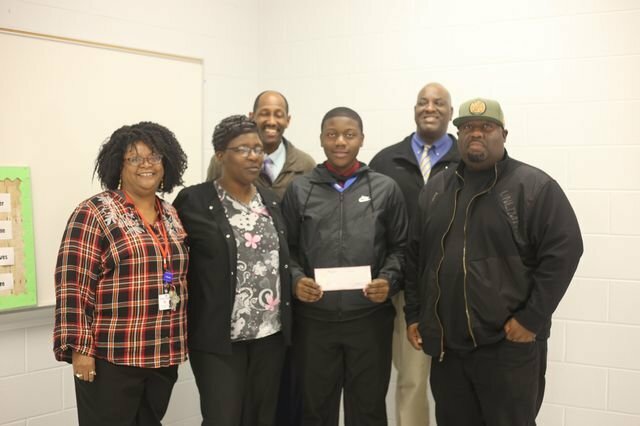 The Abbeville High School Chapter sponsored a Christmas brunch for faculty and staff, where Tyler was recognized for his dedication, perseverance, and hard work. Pictured on front row from right to left are Mrs. Davis, Business Education Teacher, Mrs. Jones, Tyler Jones, Mr. Jones. Pictured on back row Darryl Brooks-Principal, Dr. Dennis Brand, Career Tech Director.